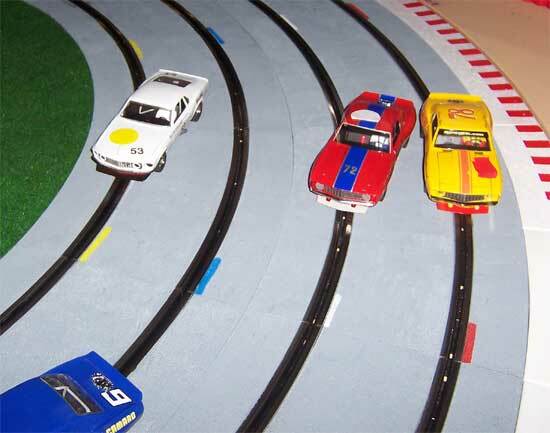 Round 8 is over with a large turnout of 14 racers comprising of the usual punters and a new racer in Greg 2 and a couple of old faces who decided to show on the night. 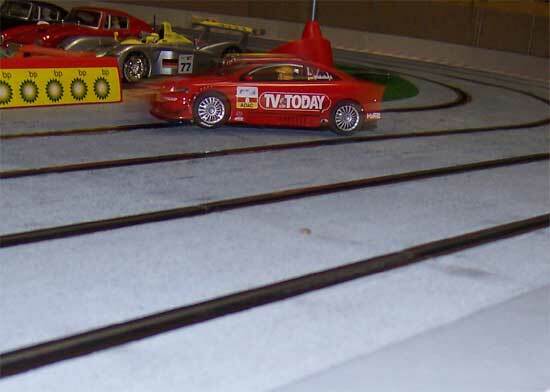 The classes consisted of Scalextric Trans Am cars, Restricted Touring cars and the fourth round of our Ninco Porsche 934 cup with NC1 motors. 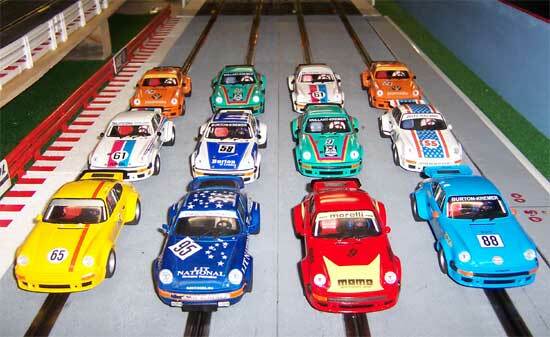 As all our races are run there are no magnets allowed so all classes bar the Ninco Porsches can have weight added. 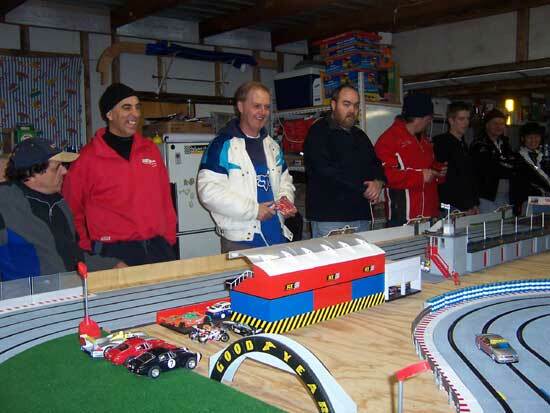 The first pic shows the turnout of racers from left to right is Joe and Bo marshalling with Glenn, Greg, Greg 2and Jacob racing and Charlie and Chris marshalling down the other end. Charlie giving eventual winner Devious Dave a bit of a close call. Dave quietly went about business not getting involved in all the barging and sniping about special tyres the works teams of Bo, Joe and Myself were using. Bo showing a clean pair of heals to the field at the start of the heat. Then came Charlie, Al, Chris, Jacob, Greg, Glenn, Greg2 and Cameron. 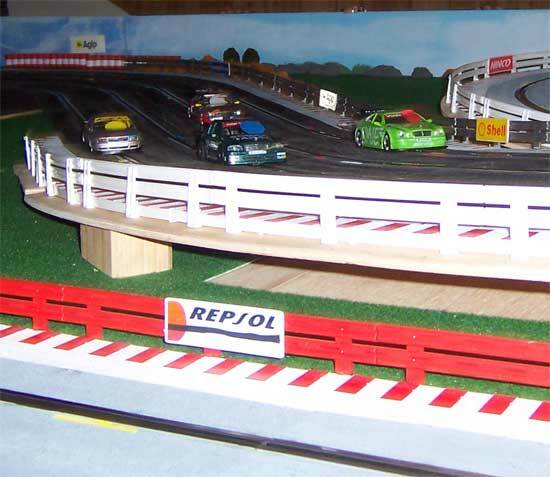 Next up were the restricted touring cars. 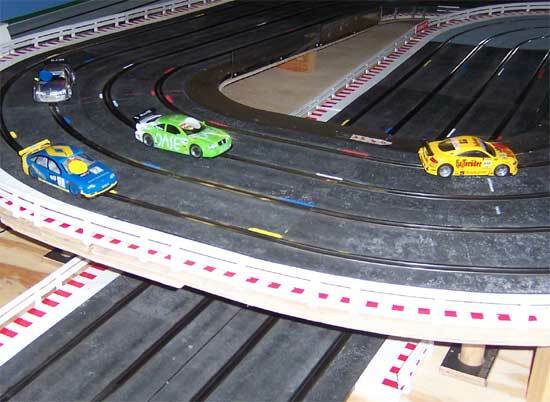 Here Bo leads with the Ninco NC1 Audi from Chris with the Ninco NC1 Mercedes, Al with the Scalextric Renault and Charlie with the Ninco NC1 Mercedes. Jacob taking a closup shot of my SCX Astra which was a last minute decision to race. Turned out to be the right one as it got quicker as the engine wore in over the night. Daniel lifting the inside wheels on the Scalextric Audi. 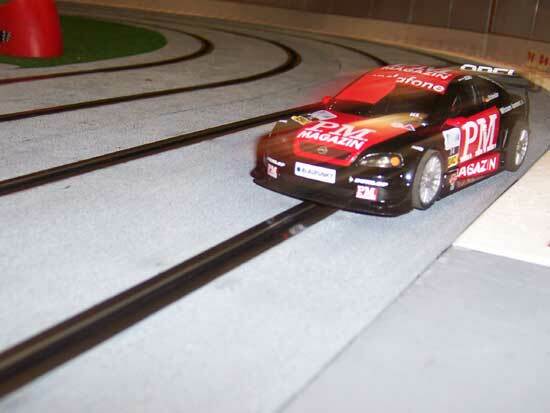 The older Scalextric cars are slowly becoming outclassed by the modern DTM cars although Joe is the only one to sort the new Scalextric touring cars for non magnet racing. 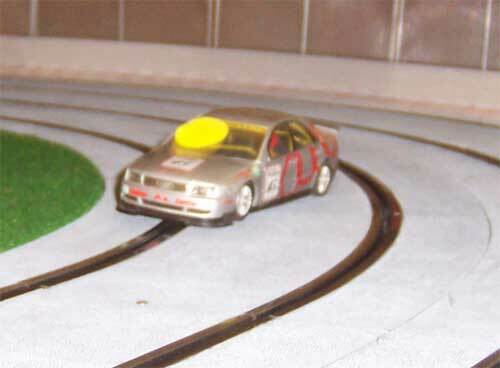 Jamies Proslot Alfa 156 with Blue motor follows Bo's Ninco Audi with a busted arse. Cameron hamming it up with the wrong tyre choice. He did get it together after earlier shorting out the rails with too much lead down low. 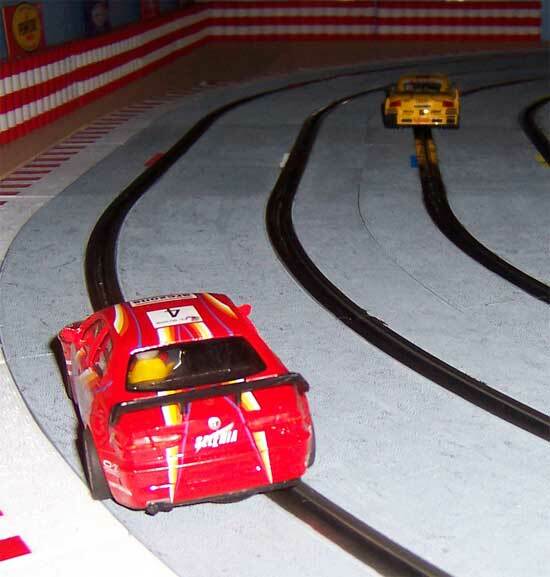 Jacob in the early Ninco Mercedes dueling with Chris in the late model car. On the top of the border of the table at the rear you can see Al's teeth if you look closly. Al was practising his charm for the ladies being the charmer he is. Just ask him. Then came Chris, Daniel, Greg, Jamie, Al, Cameron, Glenn and Greg2. Last was the Ninco Porsche 934 cup. No weight is added and NC1 across the board. 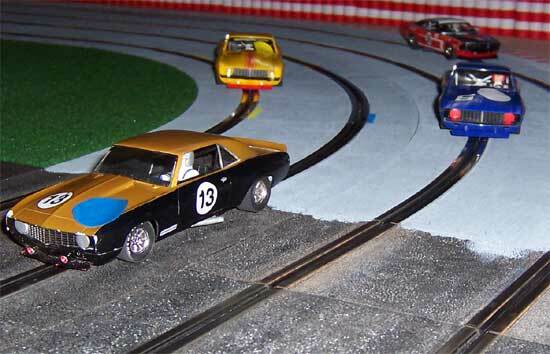 The later models seem to be a bit smoother than the early cars but it seems as though it is wise to watch for sticking shocks as once they start to stick the cars do not handle as well and a change is the only cure. I am guessing they starty to score the inside of the shock. This was the only pic of the Porsches as my bateries were dead so I will give the results of the four four minute heats. Then came Chris, Dave, Charlie, Cameron, Greg2 and Al. Glenn and Greg's wives were calling so they had to miss the Porsches but it was still good to see them there while the cake lasted. See you all next round.